At today’s press conference, Charlotte Observer beat reporter Jourdan Rodrigue asked a routine question to Cam Newton. The Panthers quarterback gave an answer, but only after saying, “It’s funny to hear a female talk about routes.” Oh? Update (7:38 p.m. ET): Rodrigue has released a statement and said that Newton was given a chance to apologize and did not. She asked the quarterback if he really didn’t think a female could understand routes. Newton said she wasn’t really seeing specific routes when watching the game, she was just seeing if somebody was open. She argued that he didn’t know what she saw nor how hard she had studied football, and that maybe the two of them needed to have a deeper conversation. Newton said that maybe he should have said it was funny to hear “reporters” talk about routes and that, if she actually did know about them, then she knew more than most reporters. Then he gestured toward the locker room, still filled with her colleagues. Rodrigue ended by asking Newton – whom she had introduced herself to on the first day of her employment with The Observer in October 2016 – if he knew her name after she had covered the team almost every day for the past year. “Jourdan Rodrigue, Charlotte Observer,” she said, and then walked away. Update (Oct. 5, 9:12 p.m. ET): Newton has issued an apology. 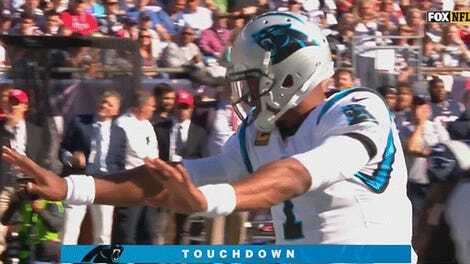 Cam Newton Gives Same Answer Five Times, Talks About "Donkey Kong Suh"